Helen Gwynne-Vaughan represented the flower of the New Woman–gently-bred, but very well educated–and further established herself as one of the many heroines of WWI. Before the war, Gwynne-Vaughan made her mark as a botanist and mycologist, earning her Doctor of Science in 1907 at the age of twenty-eight. She was soon given her own research school of fungal cytology at Birkbeck College in London, and in 1909, she was named head of the botany department. She married David Thomas Gwynne-Vaughan, a prominent paleobotanist and fellow colleague, in 1911, but her academic studies were cut short by the war, and her marriage ended by Dr. Gwynne-Vaughan’s premature death in 1915. Gwynne-Vaughan threw herself into war work and public duties, and she was tapped to lead the newly-established Women’s Army Auxiliary Corps in early 1917. The WAACs were created to free up even more men for fighting, and “the plan was for these women to serve as clerks, telephonists, waitresses, cooks, and as instructors in the use of gas masks.” March of that year saw 14 cooks and waitresses sent to France, but by the time of the Armistice, “there were 1058 controllers and administrators, 8529 members serving abroad and 30,155 at home” for a total of 39,742 women serving with the WAACs. Gwynne-Vaughan’s administration earned her high praise, and on April 9, 1918, as a mark of favor, Queen Mary assumed the position and title of Commander-in-Chief of the Corps, and it was renamed Queen Mary’s Army Auxiliary Corps. 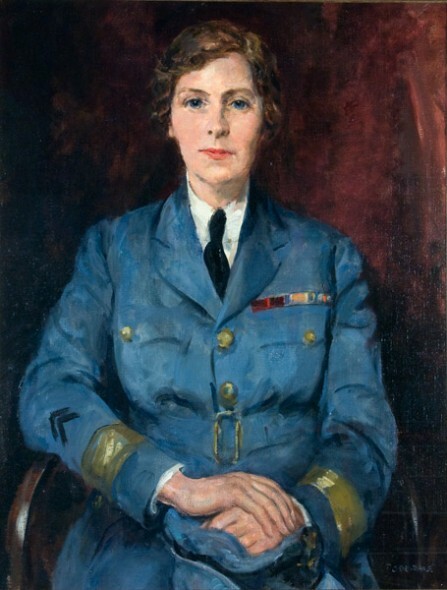 There was a bit of a shake-up in the Women’s Royal Air Force (WRAF) in 1918, and Gwynne-Vaughan was appointed Commandant, replacing the beleaguered Violet Douglas-Pennant, and remained at that post until 1920. For her war work Gwynne-Vaughan was named a Dame of the British Empire in late 1919. She returned to her academic studies after the war, but her efficiency and skill in steering both the WAACs and the WRAF did much to change male attitudes towards women in the military, and she continued to remain active in women’s military involvement through WWII. I don’t recognise the name Helen Gwynne-Vaughan. But as I have been interested in the newly-established Women’s Army Auxiliary Corps, I have followed their battle to become established and then respected. Clearly the WAACs were created to free up more men for fighting, but they still had to work with men in the field, abroad or at home. Did Helen Gwynne-Vaughan’s professional reputation pre-war stand her in good stead with the WAACs? Or did she take over the WAACs too late in the war to help them gain respect and admiration? The name Helen does conjure up an intellectual woman! Though the WAACs were not a military unit like the WRAF or the WRNS, their contribution was vital to the war effort. There was a brief smear campaign against the women’s chastity (ironically, the sort of smear campaign which ousted Violet Douglas-Pennant from the WRAF), but it was quickly disproved and the deaths of a few in an air raid brought about respect for the WAACs alongside the BEF. I love hearing stories about strong women like Helen Gwynne-Vaughan. Makes me want to write another story! @Mary: You should! I’m having a blast discovering these long-forgotten heroines of WWI and struggle with not trying to cram them all into one book.